Designed for MK3 size chemical canisters like Defense Tech, Mace, Capstun, Punch, etc. For cans 1.5 to 2.5 oz. Fits Fox Labs 1.5 oz Mean Green or 2 oz original formula cans. Fits cans up to 1.5 inches in diameter, included foam spacer for short cans. 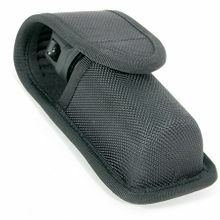 Made of cordura nylon with taped seams and polymer insert to protect contents and allow one hand deployment. Black snap closure.